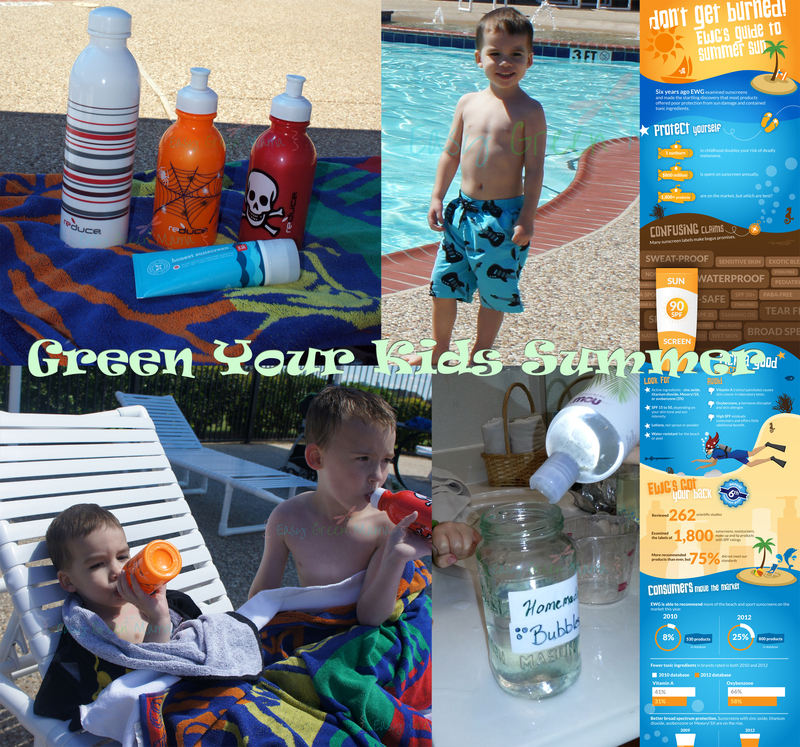 GREEN Your Kids Summer! 5 Easy Tips! •First Check out your sunscreen rating at EWG’s Guide to Sunscreens. The rating reflects the hazard of the combined ingredients. The lower the rating the better. •Since children are more sensitive to chemical allergens test a small spot on their wrist first. Opt for reusable swim diapers instead. They are reusable, they do not get waterlogged and no chemicals! They are designed to keep solids (poo) from getting in the pool, but do not absorb water so urine can get out. You may want to add an absorbent cloth diaper insert when babies out of pool. You can get swim diapers for as cheap as $10 dollars. Target even sells Charlie Banana Reusable Swim Diaper in store! My 3 year old is potty trained now but I still can use his 24 month size iplay swim diaper! Instead use BPA free water bottles. 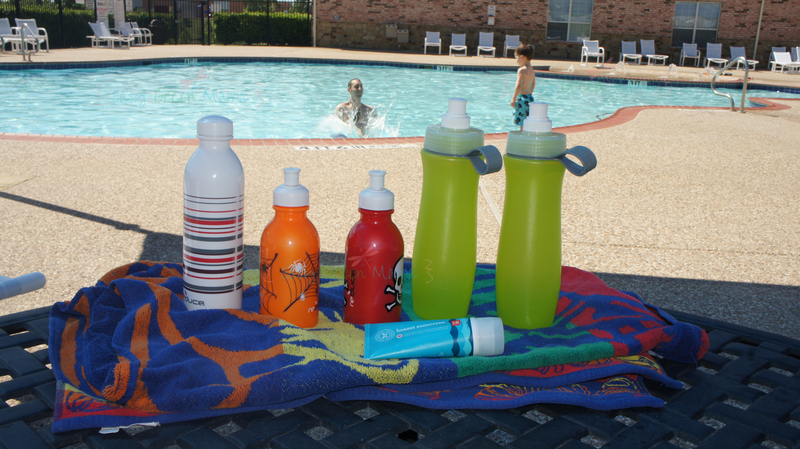 We use Brita water bottles with filters, and the kids love their Reduce Kids Water Bottles. The Reduce Bottles come in a variety of themes and are all BPA free. Not only are you reducing your kids exposure to possible chemicals in plastic bottles but also it’s better for the environment! Again reduce kids and your own exposure to chemicals like DEET. Here is a Guide to Bug Repellents for Kids from Parents.com. Check my post for Homemade Bug Spray Recipes HERE. 5.Have Summer Fun with non-toxic Homemade Bubbles! Mix all ingredients in a container. Let stand uncovered overnight for best results. We used pipe cleaners to make the bubble wands! My boys had so much fun just making different shapes with the wands. Hope you have yourself a Green Summer! Homemade bubbles are so much fun to make! Thank you so much for the bubble recipe! Most of my bubble recipes have failed because I guess the soap to water ratio. The last bottle of bubbles smelled horrible, even my husband (who often jokes at my “green-obsessed” compulsions) commented that he did not feel safe blowing bubbles for our sons. Thanks Alanna. And my bubbles did not stink! Haha! we cloth diaper so instead of buying swim diapers i just take one of our unstuffed pocket diapers and put it on! the way we go through bubbles i will definately be trying your recipe as soon as the current vat of bubbles is done! I use cloth diapers on my newborn, so I will defiantly try just using his cloth diapers as a swim diaper! Thanks! The world of diapers gets better and better. I wrote an article about Green Diapers for a regional Parent magazine 2 years ago and nowhere in my research did swim diapers come up. A great new invention. I’m a grandmommy now but way-back-when I remember the gunky chemicals inside my little guy’s disposable diapers. Yuck! Never occured to me then that the chemicals probably were not safe for him. Any possibility you’d have time to stop by my Wonderful Wednesday Blog Hop this week to share this post? It goes live at 7pm EDT on Tuesday evenings and stays top of the fold until sometime Thursday. I will stop by your Blog hop. thanks for the invite! great tips! DIY bug spray is on my list to make this week! Sharing! I’m happy I found your blog on mombloggersclub.com! I love this post!! Thanks for all the great tips! Thanks for all of the great tips! I have been looking for homemade bug spray recipes because we spend a lot of time outdoors. What a great blog post! I’m especially excited to try the bug spray. Our blog has some summer safety tips here – http://blog.childrenofamerica.com/?p=511 Not as fun as bubbles but safe none the less. I like the homemade bubbles. I use essential oils for bug spray.